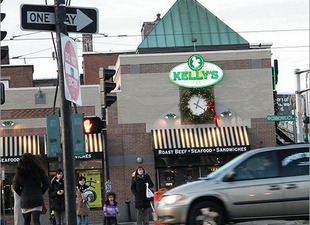 A Tedeschi convenience store is scheduled to soon open in the former Kelly’s Roast Beef retail space at the busy intersection of Commonwealth and Harvard avenues in Allston, according to the property’s owner. Carl Valeri, president and COO of The Hamilton Company, which owns the space at 1227 Commonwealth Ave., said that Tedeschi Food Shops Inc. signed a deal to sublease the location from Kelly’s on Dec. 31, began paying rent last month and has told the landlord it plans to open in June. Valeri said an existing Tedeschi shop a couple doors down at 1219 Commonwealth Ave. will close when the new store opens. He said the new space “is a better location than where they are now,” Valeri wrote in an email. A spokesman from Tedeschi did not respond to emails and voicemails sent from Boston.com. Tedeschi is the first company to sign a lease for the prominent, 5,000 square-foot space in the two years since Kelly’s abruptly closed in late 2011, though two other companies had come close securing the spot. In the summer of 2012, Korean restaurant chain BonChon Chicken was lined up to open there, but that deal fell through. Several months later, French-Asian bakery chainTous Les Jour moved to take over the space, but that deal eventually deteriorated as well, Valeri said. He said those prior deals fell through and interest in the space was tough to generate likely due to several reasons, including that Kelly’s asking sublease price was high and that the location does not have a drive thru or its own parking. He said one of the potential subtenants was too disorganized to make it through the city permitting process. Tedeschi, a convenience store chain based in Rockland was founded in 1923. The company runs about 200 stores across Massachusetts, New Hampshire, Rhode Island, and Connecticut, employs more than 2,000 workers and generates more than $600 million in annual revenue, according to its website. To see other recent business changes in Allston and Brighton, click here.